This is the first issue in a series of stamps featuring paintings held in galleries around the country. This is the first issue, and coincidentally celebrates the 150th anniversary of the National Gallery of Victoria. 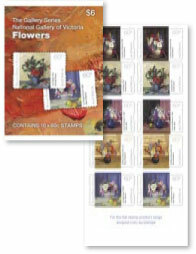 The five stamps feature flower paintings. It is not known if the theme of this series will change when other galleries are featured. The gutter strip features tubes of artist paints. 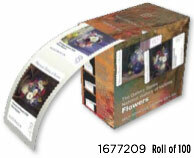 Self-adhesive versions of the stamps will be issued in coils of 100 and booklets of 10. A set of five maximum cards will accompany this issue.